Update: 28/01/2016 – Post updated to reflect vSphere 6.x enhancements. Microsoft Cluster Services (MSCS) has been around since the days of Windows NT4, providing high availability to tier 1 applications such as, MS Exchange and MS SQL Server. With the release of Server 2008, Microsoft Clustering Services was renamed to Windows Server Fail-Over Clustering (WSFC) with several updates. This post will focus on the design choices when implemented with VMware vSphere and proposing alternatives along the way. This is not intended as a ‘step-by-step install guide‘ of MSCS/WSFC. vMotion supported for cluster of virtual machines across physical hosts (CAB deployment). ESXi 6.0 supports PSP_RR for Windows Server 2008 SP2 and above releases of MS Windows Server. MSCS / WSFC is supported with VMware Virtual SAN (VSAN) version 6.1. WSFC supported on Windows deployments of the VMware vCenter Server. If you are interested in using WSFC with a Windows vCenter Server see: VMware vCenter Server Availability Guide. Be sure to review the WSFC VMware KB page for updates on supported configurations. Virtual disk formats should be thick provisioned eager zeroed. Update: vMotion support in ESXi 6.x only and for cluster of virtual machines across physical hosts (CAB) with passthrough RDMs you must use VM-hardware version 11. The vMotion network must be a 10Gbps Ethernet link. 1Gbps Ethernet link for vMotion of WSFC virtual machines is not supported. Synchronise time with a PDCe/NTP server (disable host based time synchronisation using VMware tools). WSFC/MSCS requires a private or heartbeat network for cluster communication. A shared storage drive (quorum) that is presented to all hosts in the environment that might host the MSCS/WSFC-virtual machines. Windows 2000 VM’s are no longer supported from vSphere 4.1 onwards; Windows 2003 SP2 and 2008 R2, 2012, 2012 R2 is supported. Five node clusters are possible (only two nodes in vSphere 5.0). You must use at least VM hardware version 7. Update: For vMotion support in ESXi 6.x use VM hardware version 11. Shared disks need to be the thick provision eager zeroed. Only fibre channel SANs are supported. iSCSI, Fibre Channel over Ethernet (FCoE), and NFS shared storage aren’t. Update: in vSphere 5.5, 6.x iSCSI, FCoE limitations have been lifted – restrictions apply see vmware KB2052238. NPIV, and Round-Robin multipathing is not recommended when using vSphere native multipathing. Third-party multipathing using round robin may be supported but check with your storage vendor. Note: In vSphere 5.5 PSP_RR is supported with restrictions. Update: PSP_RR is also now supported with ESXi 6.x. WSFC/MSCS not supported with vSphere FT.
Increasing the size of the disks, hot add/CPU and memory is not supported. Memory overcommitment is not recommended, overcommitment can be disruptive to the clustering mechanisms (optionally set VM, memory reservations). Paravirtualised SCSI controllers not currently supported (this may be lifted – check VMware compatibility guides). Pausing or resuming the VM state is not supported. Invariably it depends on the application, the application needs to be cluster-aware, not all applications support Microsoft Cluster Services. See MSCS alternative with Exchange 2010 Database Availability Groups (Cluster Continuous Replication – CCR & Standby Continuous Replication – SCR). Alternative to MSCS/WSFC use SQL always on availability groups. Drives that are shared between clustered nodes, this is a shared drive which is accessible to all nodes in the cluster. This ‘shared’ drive is also known as the quorum disk. A private heartbeat network that the nodes can use for node-to-node communication. A public network so the virtual machines can communicate with the network. 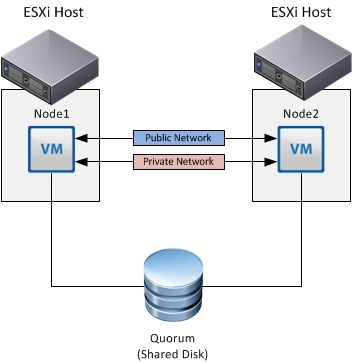 Cluster In A Box (CIB): When virtual machines are clustered running on the same ESXi host. 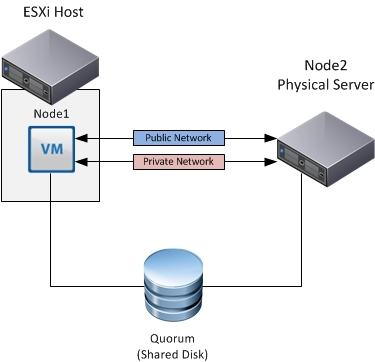 The shared disks or quorum (either local or remote) is shared between the virtual machines. CIB can be used in test or development scenarios, this solution provides no protection in the event of hardware failure. You can use VMDK’s (SCSI bus set to virtual mode) or RAW Device Mappings (RDMs), RDMs are beneficial of you decide to migrate one of the VM’s to another host. Cluster Across Boxes (CAB): MSCS is deployed to two VM’s and the two VM’s are running across two different ESXi hosts. This protects against both software and hardware failures. Physical RDMs are the recommended disk choice. Shared storage/quorum should be located on fibre channel SAN or via an in-guest iSCSI initiator (be aware of the impact with the latter). Virtual Machine + Physical: [VM N + 1 physical] clusters allows one MSCS cluster node to run natively on a physical server, while the other runs as a virtual machine. This mode can be used in order to migrate from a physical two node deployment to a virtualised environment. Physical RDMs are the recommended disk option here. Shared storage/quorum should be located on fibre channel SAN or via an in-guest iSCSI initiator (again be aware of the impact of using in-guest iSCSI). Disk types : An option when you add a new disk. You have the choice of VMDK, virtual RDM – (virtual compatibility mode), or physical RDM (physical compatibility mode). SCSI bus-sharing setting: virtual sharing policy or physical sharing policy or none. The SCSI bus-sharing setting needs to be edited after VM creation. None: Used for disks that aren’t shared in the cluster (between VM’s), such as the VM’s boot drives/temp drives pages files. Virtual: Use this value for cluster in box deployments (CIB). Physical: Recommended for cluster across box or physical and virtual deployments (CAB, & virtual + physical). Raw Device Mapping (RDM) used by quorum drive (see requirements for deployment use cases). Here the hardware characteristics of the LUN are hidden to the virtual machine, the VMkernel only sends read/write I/O to the LUN. The vmkernel passes all SCSi commands to the LUN, with the exception of the REPORT_LUNs command, so the VMKernel can isolate the LUN to the virtual machine. This mode is useful for SAN management agents (or SAN snapshots) FC SAN backup other SCSI target-based tools. ESXi 5.x and 6.x uses a different technique to determine if Raw Device Mapped (RDM) LUNs are used for MSCS cluster devices, by introducing a configuration flag to mark each device as “perennially reserved” that is participating in an MSCS cluster. For ESXi hosts hosting passive MSCS nodes with RDM LUNs, use the esxcli command to mark the device as perennially reserved: esxcli storage core device setconfig -d <naa.id> --perennially-reserved=true. See KB 1016106 for more information. MSCS requires a private or heartbeat network for cluster communication. This means adding a second virtual nic to the VM which will be used for heartbeat communication between the virtual machines. This potentially means separate virtual machine port groups (recommended to use separate VLAN per port group for L2 segmentation). If using in-guest iSCSI initiators, be aware that SCSI encapsulation is performed over virtual machine network. The recommendation is to separate this traffic from regular VM traffic (ensure you identify and dedicate bandwidth accordingly). If you currently overcommit on resources, identify the root cause and address any issues (CPU/Memory), setting reservations is highly recommended in such scenarios. If you intend to use reservations, have a look at reservations using resource pools versus reservations at a VM level (Inappropriate use of reservations or badly architected resource pools can make the problem worse). Factor in the application workload requirements, often providing high availability is only part of the solution. Account for application workload (CPU/Memory/Network/IOPs,Bandwidth) in order meet KPI’s or SLA’s. If you intend to reserve memory or CPU, factor in the impact to the HA slot size calculation. For example: if you use ‘Admission Control, host failures the cluster can tolerate’. Larger slot sizes impact consolidation ratios. You cannot use RDMs on local storage (see limitations), shared storage is required. Virtual storage appliances on local disks using iSCSI can be looped back to support this (not recommended for tier 1 applications). Using vSphere DRS does not mean high availability is assured, DRS is used to balance workloads across the HA cluster. Note: For MSCS deployments, DRS cannot vMotion clustered VMs (vMotion supported in vSphere 6.x, allowing for DRS automation) DRS can make recommendations at power on for VM placement. DRS anti-affinity rules should be created prior to powering on the clustered VM’s using raw device mappings. VMware recommend setting the VM’s with individual DRS setting to partially automated (forVM placement only). You should use ‘Must Run’ rules here, also set the advanced DRS setting ForceAffinityPoweron to 0. For CIB deployments create VM-to-VM affinity rules to keep them together. For CAB deployments create VM-to-VM anti-affinity rules to keep them apart. 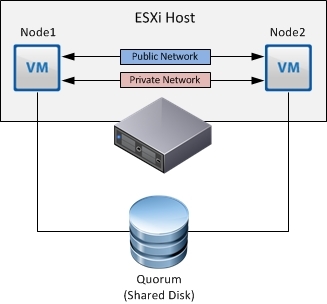 These should be ‘Must Run’ rules as there is no point in having two nodes on the same ESXi host. Physical N+1 VMs don’t need any special affinity rules as one of the nodes is virtual and the other physical, unless you have a specific requirement to create such rules. Important: vSphere DRS also needs additional ‘Host-to-VM’ rule-groups, because HA doesn’t consider the ‘VM-to-VM’ rules when restarting VM’s in the event of hardware failure. For CIB deployments, VM’s must be in the same VM DRS group, which must be assigned to a host DRS group containing two hosts using a ‘Must Run’ on hosts in group rule. For CAB deployments VM’s must be in different VM DRS groups. The VM’s must be assigned to different host DRS groups using a ‘Must Run’ on hosts in group rule. If you are using physical mode RDM’s you will not be able to take advantage of VM-level snapshots which leverage the vSphere API for Data Protection (VADP). In scenarios using physical mode RDM’s you may want to investigate SAN level snapshots (with VSS integration) or in-guest backup agents. SAN snapshots using physical RDM’s allow you to take advantage of array based snapshot technologies if your SAN supports it. In guest backup agents can be used but be aware that you may need to create a separate virtual machine port group for backups, unless you want backups to be transported over your VM network! It is also worth noting that this doesn’t provide you with a backup of the virtual machine configuration information (.vmx or any of the vmware.log information) in the event you need to restore a VM. Account for the impact of MSCS at your disaster recovery site, do you plan on a full MSCS implementation (CAB/Physical N+1). What type of infrastructure will be available to support the workload at your recovery site? Is your recovery site cold/hot or a regional data centre used by other parts of the business? Have you accounted for the clustered application itself? What steps need to be taken to ensure the application is accessible to users/customers? Adhere to the RTO/RPO – MTD requirements for the application. Lastly it goes without saying make sure your disaster recovery documentation is up to date. If architected correctly with VMware vSphere, a virtual implementation can meet the demands for tier 1 applications. Can reduce hardware and software costs by virtualising current WSFC deployments. Use VM-Affinity and Anti-affinity to help avoid clustered vm’s on the same host during power on operations or host failures. Use VM-to-Host rules (DRS-Groups) you can be used to locate specific VMs on particular hosts, ideal for use on blade servers where a VM can be housed on hosts from different blade chassis or racks. When using RDM’s remember that each presented RDM reserves one LUN ID of which the maximum is 256 per ESXi host. Taking into account the limitations stated above, in my opinion the biggest drawback is the high operational overhead involved with looking after virtual WSFC clusters. WSFC solutions can be complex to manage. Keep the solution simple! think about the operational cost to support the environment whilst obeying the availability requirements. If you are looking at virtualising your MS clusters – vSphere is a great choice with many features to support your decision (HA, DRS – Anti-Affitity Rules). However, before making any decisions an assessment of the design implications should be performed in order to identify how they affect availability, manageability, performance, recoverability and security. Migrating from physical to virtual instances of MSCS/WSFC may also offer a reduction in hardware and software costs (depending on your licensing model). It is also worth looking at other solutions which could be implemented, for example: native high availability features of VMware vSphere (VM & App monitoring, HA, Fault-Tolerance), these can provide a really good alternative to MS clustering solutions. In the end the decision to use WSFC essentially comes down to the workload availability requirements defined by the customer or business owner, this will ultimately drive the decision behind your strategy. Store operating systems on the SAN, generally this provides higher availability, redundancy & recovery depending on the RAID & SAN configuration. In diskless server builds to reduce power consumption by having no internal disks. Blade architecture, where internal disks aren’t large enough to hold application and OS (not so much of an issue now considering the density of modern 3.5/2.5” disks). Minimize system downtime, perhaps a critical component such as a processor, memory, or host bus adapter fails and needs to be replaced. You need only swap the hardware and reconfigure the HBA’s BIOS, switch zoning, and host-port definitions on the storage processors. Boot from SAN alleviates the necessity for each server to have its own direct-attached disk, eliminating internal disks as a potential point for failure. Thin diskless servers also take up less rack space, require less power, and are generally less expensive because they have fewer hardware components. Centralised management when operating system images are stored on networked disks, all upgrades and fixes can be managed at a centralized location. Changes made to disks in a storage array are readily accessible by each server (This includes benefits in capacity planning as you typically have a holistic view of your SAN environment) . All the boot information and production data stored on local SAN ‘A’ can be replicated to local SAN ‘B’ (see 3PAR Peer Persistence) or one at a geographically dispersed disaster recovery site. If a disaster destroys functionality of the servers at the primary site, the remote site can take over with minimal downtime. Recovery from server failures is simplified in a SAN environment. With the help of snapshots, mirrors of a failed server can be recovered quickly by booting from the original copy of its image. As a result, boot from SAN can greatly reduce the time required for server recovery. With older windows operating systems – (Windows 2003) it was recommended that the boot LUN should be on separate SCSI bus from the shared LUNs (to avoid issues with SCSI-bus resets disrupting I/O – causing a BSOD. In windows 2008/2012 this is not an issue, boot LUNS can share the same bus/path). Financial risk, understand that CAPEX costs can be higher than if you were to boot off you local disks (additional HBA’s, cabling & sfp’s). If you calculate the £ per GB cost of a typical high-end SAN versus the cost of mirrored drives it can be allot more. Do you have enough physical capacity in your array to support this? if not you will need to buy more disks increase throughput/IOPs. If a host/nodes swap out pages frequently this could result in heavy I/O traversing your storage fabric, this may negatively impact services (especially latency-critical apps). This might not be apparent if you have a few servers, but what if you have many that have a BFS (Boot From SAN) requirement. This can be mitigated to some extent by moving page-files to local disks or installing more memory. If this is a SQL server investigate using ‘Lock Pages in Memory’ function, to prevent SQL from paging workloads out unnecessarily (let SQL manage it’s working set size, check buffer pool to RAM ratio too). Migrating OS to BFS in some situations can have a negative impact on the array or fabric switches potentially causing contention (check ISL fan-in ratios). This is more of an issue with iSCSI/NFS than FC due to the nature of the protocol. Ensure that your fabric switches – core/access have enough bandwidth to supply I/O demands. In some situations even storage processors could be overwhelmed (check host queue depth settings – this allows the host to throttle back I/O). Check that you have enough FC/FCOE/iSCSI/NFS uplinks to service any high I/O workloads. Certainly the most opted for solution is to increase array side cache, but this is often the most costly option and doesn’t really address the root cause of any latency or throughput constraints. Be mindful of boot storms after an outage or in VDI deployments, you may have to selectively boot tier1 apps in phases (bear in mind tier 1 application dependencies such as DNS, LDAP or Active Directory servers, they need to be started first). Review your tier 1 app service dependencies and their IOPs requirements (see point above for throughput considerations). The Boot LUN should be the lowest-ordered LUN number that exports to the host (3PAR recommended), however some arrays assign LUN0 to the controller in which case LUN1 can be used. NOTE: With the introduction of the Microsoft Storport driver, booting from a SAN has become less problematic. Refer to http://support.microsoft.com/kb/305547. For the initial boot, restrict the host to a single path connection on the 3PAR array. Only a single-path should be available on the HP 3PAR StoreServ Storage and a single path on the host to the VLUN that will be the boot volume (this can be changed after the host has booted and you have installed the MPIO driver). It goes without saying check that your SAN, FC switch, server & HBA cards are running the latest firmware. If you are using clustering ensure nodes in a cluster have sole access to the boot LUN (1:1 mapping), using LUN masking (array side). Use soft zoning (zoning per pWWN), generally this is a requisite for HP 3PAR – but in terms of booting from SAN provides more flexibility. However, if the HBA card fails you will need to update LUN masking and soft zoning configurations. Virtual volumes are the only data layer visible to hosts. After devising a plan for allocating space for host servers on the HP 3PAR StoreServ Storage, create the VVs for eventual export as LUNs to the Windows Server 2012/2008 host server. You can create volumes that are provisioned from one or more common provisioning groups (CPGs). Volumes can be fully provisioned from a CPG or can be thinly provisioned. You can optionally specify a CPG for snapshot space for fully-provisioned volumes. (Don’t forget, that if your requirements change – and you need to convert these volumes to thin provisioned volumes or vice-versa use the 3PAR System Tune operation). Use the Create Virtual Volume wizard to create a base volume. Next perform softzoning / LUN masking, see key point mentioned earlier about only presenting a single path to host. After you have installed the MPIO drivers (post OS install) present additional paths. Check and enable HBA BIOS (BIOS for arrays must be disabled that are not configured for boot from SAN). Auto Discover—When enabled, boot information, such as the location of the boot LUN,is provided by the fabric (This is the default value). Flash Values—The HBA obtains the boot LUN information from flash memory. First LUN —The host boots from the first LUN visible to the HBA that is discovered in the fabric. Select a boot device from discovered targets. Then just save changes and exit. Boot the Windows Server 2012/2008 system following the instructions in the BootBios update manual. Select Configure the Adapter’s Parameters. Select Enable or Disable the BIOS; for SAN boot, ensure that the BIOS is enabled. Press Esc to return to the previous menu. Select Auto Scan Setting; set the parameter to First LUN 0 Device; press Esc to return to the previous menu. Select Fabric Point to Point for fabric configurations. Select FC-AL for direct connect configurations. Press Esc to return to the previous menu if you need to set up other adapters. When you are Finished, press x to exit and reboot. Note: use the QLogic HBA Fast!UTIL utility to configure the HBA. Record the Adapter Port Name WWPN for creating the host definition in the 3PAR IMC (however if server is zoned correctly you should see the HBA pWWN’s when adding a new host). Ctrl+Q keys when the HBA BIOS prompts appear. In the Fast!UTIL utility, click Select Host Adapter and then select the appropriate adapter. In the Adapter Settings window, set the following. Press Esc to exit this window. Click Selectable Boot Settings. In the Selectable Boot Settings window, set Selectable Boot Device to Disabled. Press Esc twice to exit; when you are asked whether to save NVRAM settings, click Yes. After the Windows Server 2012/2008 host completely boots up and is online, connect additional paths to the fabric or the HP 3PAR disk storage system directly by completing the following tasks. On the HP 3PAR StoreServ Storage, issue createhost -add <hostname> <WWN> to add the additional paths to the defined HP 3PAR StoreServ Storage host definition. On the Windows Server 2012/2008 host scan for new devices. Reboot the Windows Server 2012/2008 system. HP 3PAR LUNs on Windows standalone servers. HP 3PAR LUNs that are used in Microsoft Failover Clustering and are not configured as “shared storage” on the Windows failover cluster. If HP 3PAR LUNs that are used in Microsoft Failover Clustering are configured as shared storage, then they will not experience the same problem (that is, be marked offline) as in a Windows standalone-server configuration. Right-click each of the HP 3PAR LUNs. HP recommends the execution of Microsoft KB2849097 on every Windows Server 2008/2012 host connected to a HP 3PAR array prior to performing an initial array firmware upgrade. Subsequently, the script contained in KB2849097 will have to be rerun on a host each time new HP 3PAR LUNs are exported to that host. KB2849097 is a Microsoft PowerShell script designed to modify the Partmgr Attributes registry value that is located at: HKLM\System\CurrentControlSet\Enum\SCSI\<device>\<instance>\DeviceParameters\Partmgr. NOTE: The following procedure will ensure proper execution of KB2849097, which will prevent the HP 3PAR LUNs from being marked offline when the Windows server is rebooted following an array firmware upgrade. You might be prompted to confirm this action by pressing y. For high-availability storage with load balancing of I/O and improved system and application performance, Windows Server 2012/2008 requires the native Microsoft MPIO and the StorPort miniport driver. Configuring Microsoft MPIO for HP 3PAR Storage required to resolve issues with MPIO path failover, it is recommended that hotfixes KB2406705 and KB2522766 be installed for all versions of Windows Server 2008 up to and including Windows Server 2008 R2 SP1. Windows Server 2008, Windows Server 2008 SP1, and Windows Server 2008 SP2 also require that hotfix KB968287 be installed to resolve an issue with MPIO path failover. All three patches (KB2522766, KB968287, KB2406705) are required for non-R2 versions of Windows Server 2008. Only two patches (KB2522766 and KB2406705) are required for R2 versions of Windows Server 2008. If you have not already done so, check HBA vendor documentation for any required support drivers, and install them. If necessary, install the StorPort miniport driver. If the MPIO feature is not enabled, open the Server Manager and install the MPIO feature. This will require a reboot. After rebooting, open the Windows Administrative Tools and click MPIO. In the MPIO-ed Devices tab, click the Add button; the Add MPIO Support popup appears. In the Device Hardware ID: text box, enter 3PARdataVV, and click OK.
Reboot as directed, (You can also use MPIO-cli to add 3PARdataVV). Note from HP: Windows Server 2008 server connected to an HP 3PAR StoreServ Storage running HP 3PAR OS 2.2.x or later requires that the multipath policy be set to Round Robin. Windows Server 2012 or Windows Server 2008 R2 servers do not need to change the multipath policy, as it defaults to Round Robin. If the server is running any supported Windows Server 2008 version prior to Windows Server 2008 R2, and if the Windows Server 2008 server is connected to an HP 3PAR array that is running HP 3PAR OS 2.2.x, the multipath policy will default to failover and must be changed to Round Robin. However, if the OS version on the HP 3PAR array is HP 3PAR OS 2.3.x or later, then you must use HP 3PAR OS host persona 1 for Windows Server 2008 R2 or host personal 2 for Windows Server 2008 non-R2 so that the multipath policy defaults to Round Robin. In the Server Manager, click Diagnostics; select Device Manager. Expand the Disk drives list. Right-click an HP 3PAR drive to display its Properties window and select the MPIO tab. Select Round Robin from the drop-down menu.